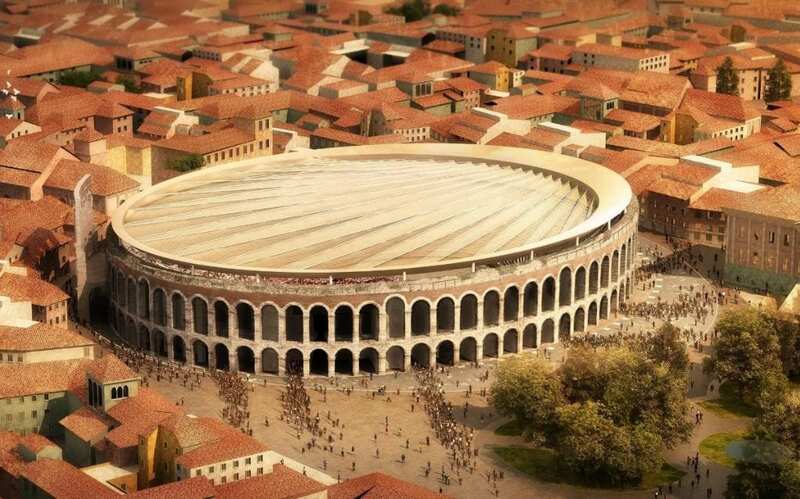 The Mayor of Verona, Flavio Tosi, announced this week that the city’s Roman amphitheatre is to sport a retractable roof to protect both opera goers and the building from inclement weather, with the design competition winners being two well-known German companies, Gerkan Marg & Partners (gmp), the architects, and Schlaich Bergermann & Partner (SBP), the engineers. The project, expected to cost €13.5m, will see a retractable roof added to the ancient building. Schlaich Bergermann & Partner and Gerkan Marg & Partners’ proposal was selected from nearly 90 put forward by firms from across the globe. SBP previously installed a retractable roof at the Commerzbank Arena in Frankfurt, Germany, in the run up to the 2006 FIFA World Cup. The well-preserved amphitheatre, hosts concerts and operas every summer, with up to 15,000 spectators attending. However, several events are forced to be cut short each summer due to heavy rain, which also affects the structure of the building. The roof, which will take the form of an extendable membrane, will fold up into a space on top of the Roman arena and will be virtually invisible from the ground. If approved by the cultural ministry in Rome the new roof should be ready for use in almost three years. There have been understandable concerns about the possible impact on the centuries-old structure but Mayor Tosi said the cover was needed to protect the arena from the elements. The main enemy is the rain. It digs down into the arena walls and causes collapses. Just look at what happened at Pompeii where crumbling walls have been a problem for years. Verona’s Roman amphitheatre was built in the 1st century AD to host athletic games, hunting and gladiator contests. It also survived an earthquake that struck the city in 1117.